In her transition from cutesy Nickelodeon sidekick to scantily clad “Dangerous Woman” singer, Ariana Grande’s love for all things Harry Potter has never wavered. It’s as if she’s always kept one of the popular books on her nightstand — right next to her hairbrush. The latest evidence of her love came this week, when the 23-year-old revealed that she’s now the owner of a “ridiculously amazing custom jacket” featuring Potter professor Dumbledore. The artist gave a closer look at the fashion statement. Even before she was rocking this jacket, Grande was easily among the boy wizard’s most hard-core celebrity fans. Behold a few of the ways she’s gained some serious Harry Potter cred. This is not a new passion for Grande. The singer has been starry-eyed about Potter & Co. since her days as a schoolgirl in Florida. We know this is true because she wrote about her childhood crush on Harry’s nemesis in a tweet. Her message was actually in response to a Twitter post that the actor who played Draco, Tom Felton, sent to Grande. She’s still going strong. In fact, Grande noted last month that she’s going to reread the entire series. When you love Harry Potter as much as Grande, you tell the world about it. The “Bang Bang” songstress has definitely done that, whether by chronicling a trip to the Wizarding World of Harry Potter at Universal Studios on Snapchat or by gushing about her obsession on the red carpet. Maybe that’s changed now that she’s won an MTV Moonman and a Grammy nomination, but it’s probably still up there! Some of the people who know the Scream Queens actress best collaborated to make her a fun Harry Potter-themed video for her birthday last month. If imitation is, in fact, the sincerest form of flattery, then J.K. Rowling should be ecstatic. 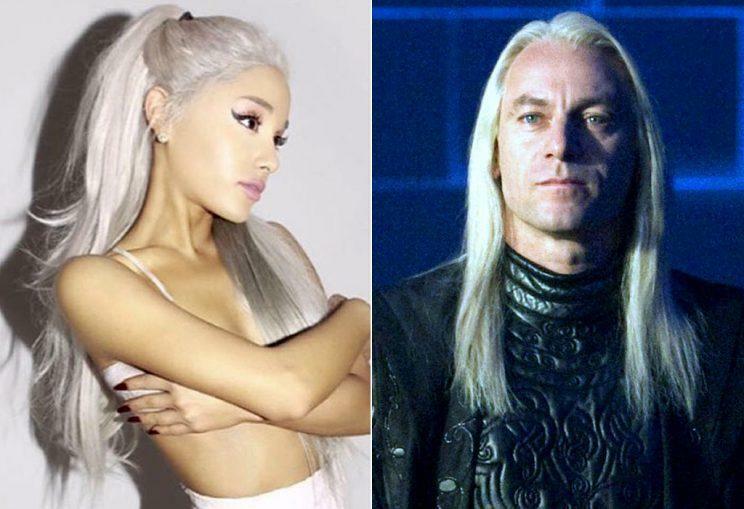 The style-conscious Grande not only owns that Dumbledore jacket, but she has also even looked to the Potter franchise for beauty inspiration, like that time last fall when she tried out a new hair color. If another Potter movie is ever made, we know who will want to play Ron Weasley’s long-lost cousin.